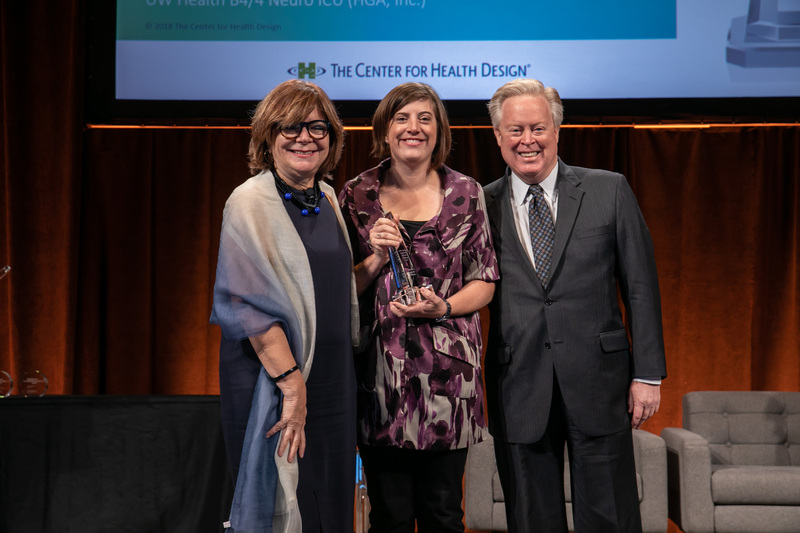 Jenny Hastings (center) and Eric Rasmussen accept the Touchstone Award from Rosalyn Cama (left) on behalf of the Center for Health Design for Boulder Associates work at Sutter Medical Foundation Roseville Oncology Center. Boulder Associates (BA) was recently awarded GOLD level for the Touchstone Award from the Center for Health Design for our work on the Sutter Medical Foundation Roseville Oncology Center. This is a significant win as the award recognizes exemplary use of Evidence-Based Design (EBD) practices to execute informed design. This commendation is validation of the value that BA’s in-house research entity, known as Examine, adds to our projects and clients. Examine, led by BA Principal Jenny Hastings and researchers Meredith Banasiak and Sarah Plane, was established in 2015 with the goal of innovating our designs, and positioning us as among the other EBD leaders in design for healthcare. The opportunity for the team to take the first step into the journey of Evidence-Based Design came when Jenny Hastings was inspired to take a different approach to design with a long-time client. Sutter Medical Foundation needed to expand to provide more space for a growing number of Oncology staff as well as to co-locate many of cancer center treatment services into the same building. BA was enlisted to help design it once the project was approved. Hastings pitched the inaugural Examine project to Eric Rasmussen with Sutter Medical Foundation. “I wanted to do a post-occupancy evaluation of one of their existing oncology facilities,” she says of the origins of the EBD project. “This would be to capture information about how well the site was performing in order to feed the design we were going to do for the new project. Understanding this, BA established design goals aimed at optimizing and nurturing personal relationships—including facilitating communication and cooperation between every member of the care team to create a more involved approach in the way providers care for patients. Following this was a week-long 3P event incorporating Lean methodology; 3P stands for people, preparation and process, and involves rapid thinking, prototyping, and simulation with key stakeholders to identify new ways of designing and supporting the care delivery model. This event saw highly engaged staff from the facility working directly with our research team. Together, the group worked up front to brainstorm, sketch out ideas, and build cardboard mock-ups representing work and care stations in the new clinic. This included a reception area, exam room, consultation room, procedure room, blood draw lab, and team work area; all of which were tested, revised and perfected throughout the week. In a first for BA, patients from the focus group were then brought in to the 3P to run simulations and provide feedback to the group. A group of both patients and staff worked up front to brainstorm, sketch out ideas, and build cardboard mock-ups representing work and care stations in the new clinic. With a focus on care team relationships, BA’s research team conducted studies on the occupied space to evaluate how well those initial performance goals were met. For example, BA surveyed the staff to learn how the environment was supporting team communication. Findings describe how different relationships, such as patient-clinician and clinician-clinician, are supported by the design and linked with increased quality of care. The end result—carried through the entire project—is a layout that was unique to any Sutter Health facility Boulder Associates had done. Sutter Health has even advertised the facility as “designed for the patients by the patients.” Team work areas, or pods, were designed around groupings of providers and their care team to support team integration and allow for enhanced collaboration among roles. Exam rooms, which were a significant focus of the mock-ups, were designed to respect patient dignity, confidentiality and social/familial support systems. Additionally, key focus was put into ensuring clinical empathy via communication, engagement and efficiency of care between clinicians and patients. Read more about the project findings here.